On this blog in the past, I have extensively discussed the drought research of Aiguo Dai and others. Today I'd like to add coverage of a new paper in Nature that Dai has published. Here most of the US is in a wetting trend - in contrast to the average model run, which had the US drying out noticeably already. So perhaps the models somehow get the regional distribution wrong and the US will continue to get wetter in future? Dai has now explicitly addressed this question, and while I think his case is less than cast-iron at present, the evidence suggests that the answer is no - the US just got lucky in the sixties through the nineties, and its luck is unlikely to continue to hold. So what is new in this paper? There are several technical developments. Firstly, Dai is now using a suite of model runs from the CMIP5 runs (which can probably be viewed for practical purposes as close precursors of the runs that will form the foundation of the modeling section of the AR5 report that will come out next year). So these are new, presumably better, models. 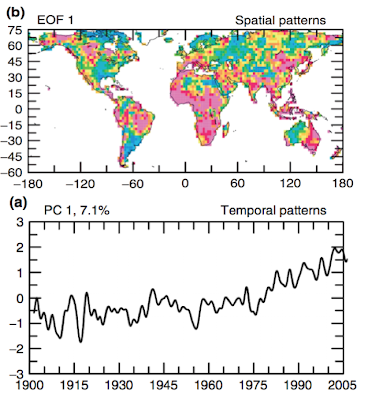 Secondly, it is well known that episodic droughts in the past have a lot to do with fluctuations in sea-surface temperatures. If a large section of the ocean off the coast of some particular land region is a few degrees warmer, that can have a large effect on the moisture supply to that region (recall that the water holding capacity of air increases about 7% for every degree celsius increase in temperature). There are chaotic fluctuations in the ocean circulation that cause multi-decadal changes in where the warmest water is and these can control droughts and wet periods on land. 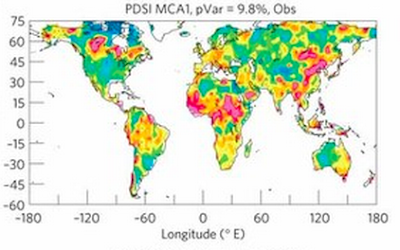 This motivates Dai in this latest paper to switch from using principal component analysis on the PDSI data alone to using maximal covariance analysis on both the PDSI and sea surface data. Maximal covariance analysis is a cousin of principal components analysis in which instead of trying to find the main modes of variation in a single data set, we try to find the main modes that cause two datasets to covary together (in this case PDSI - the drought index - and sea surface temperatures). (The green line is an index of the IPO and the black lines are increasingly smoothed versions of the PDSI for the southwest US). However, whereas over the twentieth century, the model runs show a first MCA mode that varies quite a bit from model to model and only explains a small amount of the total covariance, once the 21st century is included, the picture changes greatly. 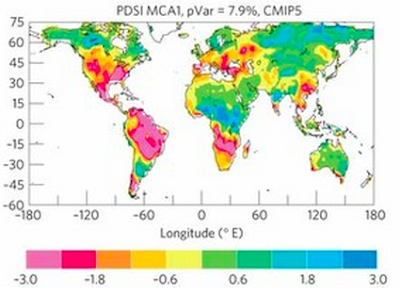 Now the effect of global warming is so great that all the models have similar MCA first modes, and that mode explains far more of the total covariance. 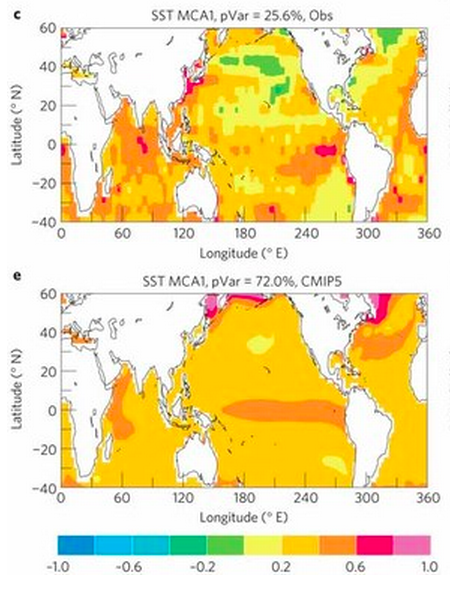 So Dai's argument is that the same thing will happen with the observations - as global warming proceeds, it will increasingly overwhelm natural sea surface temperature fluctuations, and the overall drying trend that the models show will assert itself in the US also. Indeed, arguably, this has already begun in the 1990-2010 period in which the US has been drying (culminating in the serious drought this summer). If this is right, then we can expect massive serious droughts to become an increasingly common feature of US life in coming decades. There is another possibility: that the global warming computer models are flawed. Since their predictions of both rain and temperature have both been too pessimistic over the past decade, I want to know what it will take for these computer folks to admit there is some type of error in their modeling. Where does all the water vapor go? 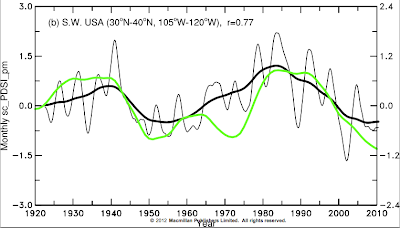 Higher sea-surface temperatures; warmer atmosphere; there has to be more water vapor going into the air. Is it somehow going to stop at the West Coast of the US? Will the North American summer monsoon shut down? The author is writing about a model that predicts weather patterns. When the model was in accurate from the 1960's through the 1990's he ascribes it to "luck". From that point on I realize I should not read any more. 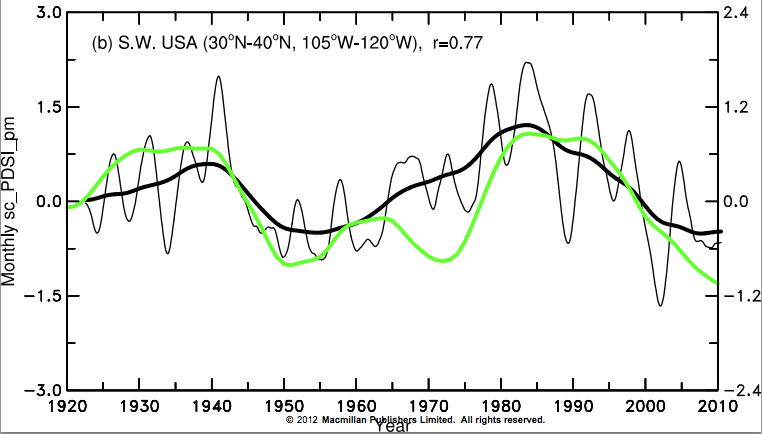 If you are going to refute a model it must be done by showing flaws in its logic. Not Luck. In the last image look at that hot plume exiting the mouth of the gulf of St Lawrence and heading north toward Greenland. I think people are right to be skeptical about the results of computer models - they are, after all, only models of something far, far more complex. If anything, these models are potentially dangerous whereas inacurate climate models are merely distracting.